Originally from non-LP single "Willow Weep For Me" b/w "Between The Devil And the Deep Blue Sea", Euterpean Records [USA], 1956. Reissued on Here Comes Carole Creveling, Vol. 1 + 2, SSJ Records [Japan], 2007. Within vocal jazz, there is a large subgenre of vocalists called One Shot Wonders that recorded one or two LP’s circa 1950-1965 and maybe some singles too, and were never heard from again. A lot of these vocalists were young single girls who went on to live the dream of getting married, having children, and living happily ever after, while collectors and music fans were left wondering what became of them. Carole Creveling is the most notorious of the One-Shot Wonder stories. 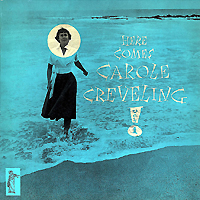 Her only LP, Here Comes Carole Creveling, Vol. 1 (1955; there is no Vol. 2), became a jazz collectors’ Holy Grail, with copies commanding four-figure sums apiece regardless of condition. Her album has a reputation as an excellent album, features some well-known session players (the most famous being Jimmy Wyble), and few copies are known to exist. To make matters worse, there was a mystery factor at play, as history seemed to be completely silent about who exactly Carole Creveling was. It was not until after the Japanese label SSJ Records released the album as a mini-LP CD in 2007 (with two songs from her follow-up non-LP single added as bonus tracks) that the story began to come together. Apparently a married couple that owned a record store in Long Beach, California, were friends with 18-year-old Carole’s parents, were impressed with Carole’s voice, and wanted to help her launch a jazz career. They hired some top-notch session musicians to back her in the studio in 1955, and cut the LP Here Comes Carole Creveling, whose only surviving press is a glowing review in Down Beat magazine. They recorded a follow-up 7” single for her in 1956, and that was it; Carole married in 1957, had babies, and disappeared without a trace. Jazz historian Bill Reed, the producer of the reissue of Here Comes Carole Creveling, was finally able to track Carole Creveling down after months of intensive research. He learned that she is still living in the Los Angeles area and was completely unaware of her status as a jazz legend. 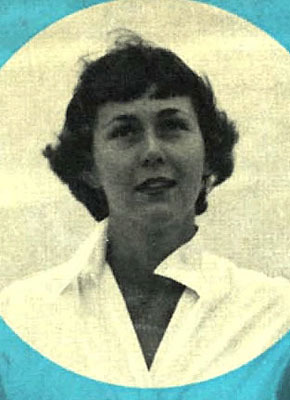 Our song, “Between the Devil and the Deep Blue Sea”, is the B-side of Carole’s 1956 follow-up single, which is included in its entirety on SSJ Records’ mini-LP CD reissue of Here Comes Carole Creveling. SSJ Records has many more intensely fascinating treasures just like this in their catalogue; you can browse SSJ’s vocal jazz catalog at this link (Japanese site with titles in English). You can buy the Japanese mini-LP CD and 180 gram vinyl LP of Here Comes Carole Creveling at Amazon.com.